Would a side-by-side option for viewing the question while answering be useful? TLDR: Could we have a toggle option that puts the Answer box next to the Question, so you can easily reference the question content when answering so you don't have to scroll back and forth. After attempting to answer a post today, I wanted to go through the question bit by bit and advise the OP an various parts of the question in order, but I found myself scrolling up and down so much that I just gave up. In hindsight I could have just opened two windows side by side like an animal. The other benefit of this view when toggled on is that you are less likely to miss key parts of the question when it's side by side. In the past I've answered questions after reading through them quickly, but then a while later someone may downvote or comment, because I missed some key information in the question. Not a duplicate of the suggestion in comment as that is relating to previewing an edit whilst editing a question side by side. This is relating to question and answer side by side. 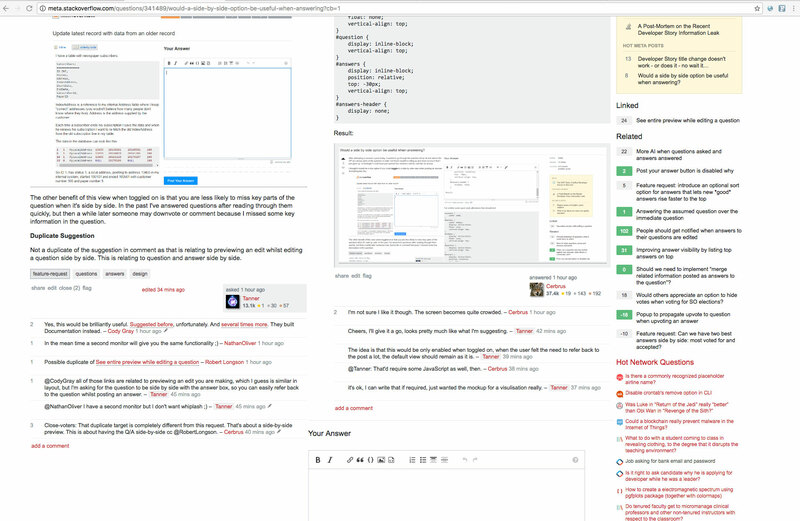 var hideSidebar=true; //Change to false if you don't want to hide the right sidebar. If you want to always have the two column format, you can just install the above code as a user script. As I was about to post this, I realized that I wanted the functionality of just being able to toggle the answer entry <form> to the beginning of the Answers section and back to its normal location without adding the two column format CSS. This will allow keeping the standard single column format, but move the answer you are working on will be right under the question. This should be handy for referring to the question while composing your answer when there are multiple answers, but you don't want a two column format. Not the answer you're looking for? 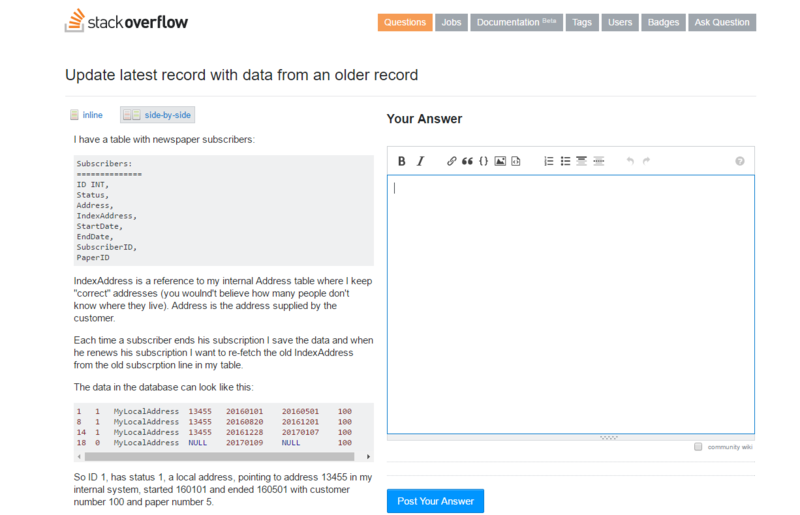 Browse other questions tagged feature-request questions answers design . Do suggested duplicate links ever disappear for the OP when there are close votes? Is it worth making the Answerer name in comments look unique? Include OP's name when they agree community's suggestion to close as duplicate (per my sole VTC)?